I'm reading The Secret Place. Two years on, though, Becca still hates the Court. She hates the way you're watched every second from every angle, eyes swarming over you like bugs, digging and gnawing, always a clutch of girls checking out your top or a huddle of guys checking out your whatever. No one ever stays still, at the Court, everyone's constantly twisting and head-flicking, watching for the watchers, trying for the coolest pose. This look like a really good read! Happy weekend! I like the 56. I have never read a French book. It's been a while since I did this meme, maybe I will join in again soon. 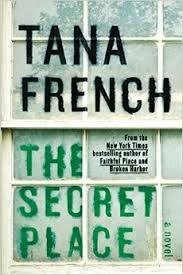 I really love Tana French's novels and this one is one of my favorites of the series. So good!